If you regularly use USB sticks to backup or transport presentation files, I’m guessing you have asked yourself this question at least once in your career (perhaps with an increasing sense of panic as you run out of places you haven’t searched). How many times have you found the stick in clothes already in the hamper? How many times have you never been able to find it at all? A recent study found that over 22,000 USB sticks get left at the dry cleaners on an annual basis. And that’s just in the U.K. This number is even more sobering when you consider that the study also revealed almost half of these sticks never get returned to their owner. This can be a major problem for several reasons. For instance, a PowerPoint file on that missing stick may be the only copy of the high-profile presentation you are scheduled to deliver tomorrow morning. It might contain highly sensitive or proprietary content. 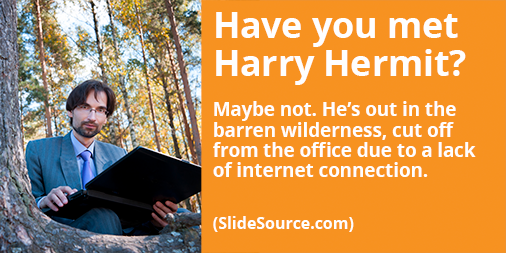 Given the risks, your best bet is to avoid relying on portable data storage altogether. SlideSource.com keeps all your slides in a secure, centrally located, cloud-based content library that is easily accessible by all the members of your team, all the time. 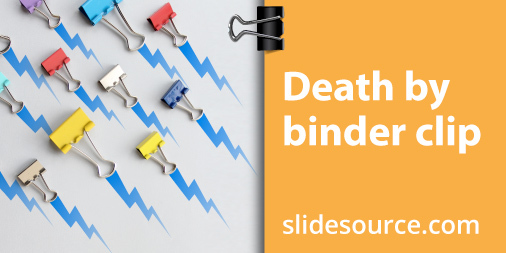 This means that your crucial files will never end up in a bin beneath your dry cleaner’s counter and you will always know exactly where the latest and greatest version of every slide and presentation can be found. SlideSource also supports tagging of individual slides and has a robust search function so slides are easy to find — even within the system. 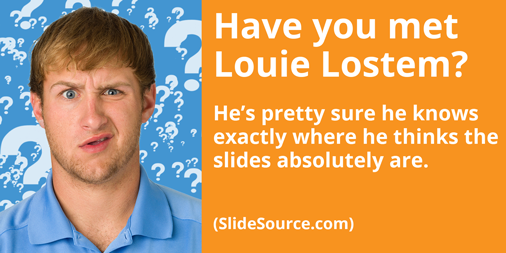 Take a few minutes to visit SlideSource.com, sign up for a free, full-featured trial account, and see how easy it is to guarantee that your presentation doesn’t get taken to the cleaners. I now suspect that this story is actually apocryphal but the person who related it to me very early in my career swore he was there when it happened. Just remember, things were different back then. Nobody gave much thought to the electrical outlet embedded in the stage floor near the lectern while the crew loaded in and set up. In fact, it went largely unnoticed until the afternoon the CEO was addressing a fairly large audience that included all of upper management and a number of his industry colleagues. High visibility. High pressure. Bad time for anything to go wrong. He took a step back and started to come around to the front of the stage because he once heard that it’s considered good form to get out from behind the lectern. More direct, more personal. On that day it was a big mistake. There was loud snap and a fat blue spark just as all the lights went out. They were certain the CEO got a good couple of feet off the ground when he jumped. Not bad for a guy his age considering his apparently sedentary lifestyle. Turns out a binder clip had been dropped at some point earlier in the day and it happened to end up right on top of that electrical outlet in the stage floor. The CEO stepped on the clip on his way to the front of the stage and pushed part of it down into the outlet, causing a short and seriously messing up the electrical system. He was fine, but it took a little more than resetting a circuit breaker to get things back to normal. The short also messed up the computer with the slides on it. The meeting was quickly moved from the auditorium to a much less comfortable, much more crowded conference room and the meeting continued without slides and without a sound system. Needless to say, the presentation wasn’t nearly as good as it should have been and there were a lot of very unhappy people on the flight home that evening. Rumor had it that there was someone from building maintenance escorted to the parking lot the next morning who was even less pleased with the turn of events. If anyone took the time to notice that the cover for the outlet was missing, no one bothered to take the time to do anything about it. I was meant to learn two things from that story. First, pay attention and try to be aware of things that aren’t the way they should be or that seem broken when setting up for a high-stakes presentation, especially when it involves the electrical system at a venue you aren’t very familiar with. Second, backups should really be a no brainer. I would be willing to bet that none of the people involved in that presentation ever temped fate again by going into a meeting with only one copy of the slide file on one computer. I don’t care how far up the food chain the presenter is, somebody has got to get a copy of the slides from them before the meeting starts. But like I said, things were different back then. The only widely used portable data storage and transfer technology was 3.5″ floppies. Most networks were slow and none of them were wireless. Any mention of the cloud usually had more to do with trying to get in a quick round of golf after lunch. There are now many more ways to create, organize, share, and store slides and presentations than ever before. We’re convinced that the best of all of these options is SlideSource.com and we invite you to sign up for a free, full-feature account and experience it for yourself. 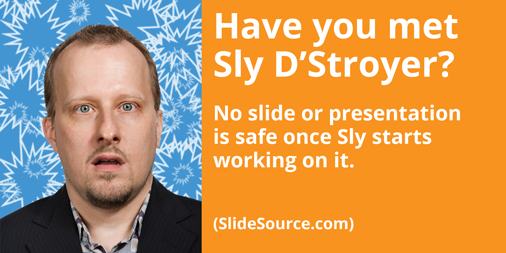 You’ll be shocked at how much more efficient, productive, and mishap proof your presentation workflow can be.